SEIU advertises for a job opening on its main site. The most important qualifications to get hired? • Train and lead members in non-violent civil disobedience, such as occupying state buildings and banks, and peaceful resistance. • Execute field plans mobilizing members around political campaigns, annual Leadership Convention, lobby days, regional meetings. 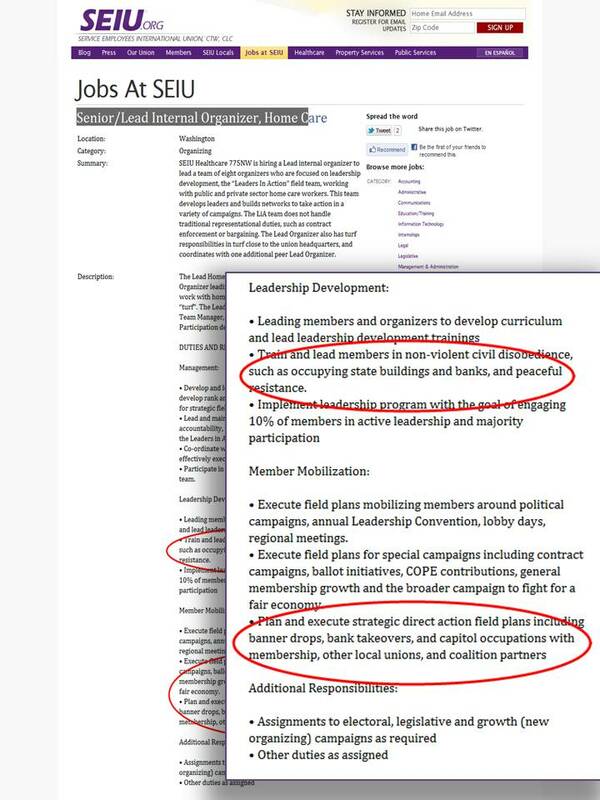 • Execute field plans for special campaigns including contract campaigns, ballot initiatives, COPE contributions, general membership growth and the broader campaign to fight for a fair economy. No worries though, this job is for real. I can only imagine what the reaction of the left would be if all things were equal but this job were for a Tea Partier.